Lots of people don’t know that April is National Stress Awareness Month; don’t fret if you’re one of them. For many, stress is already a common feature of everyday life. According to the American Psychological Association, 62% of Americans are stressed at their jobs, and stress has been estimated to cause the loss of some 275 million working days every year. In addition to its other negative physical and mental consequences, stress can also spell trouble for your oral health. It may lead to the problems of teeth clenching and grinding, which dentists call bruxism. A habitual behavior that can occur in the daytime or at night, bruxism is thought to affect perhaps one in ten adults. While the evidence that stress causes bruxism is not conclusive, there’s a strong case for the linkage. Bruxism sometimes causes symptoms like headaches, soreness or pain in the jaw muscles or joints, and problems with fully opening the mouth. It can be detected in the dental office by excessive tooth wear, and/or damage to tooth surfaces or dental work. Grinding or tapping noises heard at night may indicate that someone is grinding their teeth while sleeping. In children, nighttime bruxism is common and not necessarily a reason for concern; in adults, it may be more troubling. So what can you do if you’re experiencing this problem? If you find yourself clenching and grinding during the daytime, simply becoming more aware of the behavior and trying to limit it can help. A bit of clenching during times of stress isn’t abnormal, but excessive grinding may be reason for concern. Many of the same techniques used to relieve stress in other situations—such as taking a step back, talking out your issues, and creating a calmer and more soothing environment—may prove helpful here as well. Occasionally, prescription drugs may cause bruxism as an unwanted side effect; in this case, a medical professional may recommend changing your medication. The use of stimulants like coffee and mood altering substances like alcohol and illicit drugs have also been associated with teeth grinding—so if you’re having this issue, consider foregoing these substances and making healthier lifestyle choices. There are also a number of dental treatments that can help protect your teeth from excessive grinding. 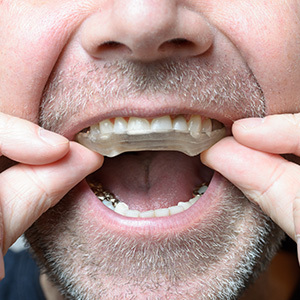 The most common is an occlusal guard or “night guard.” This is a custom-fabricated appliance made of plastic that fits comfortably over your teeth. Usually worn at night, it keeps your teeth from actually coming into contact with each other and being damaged. Occasionally, additional treatments such as bite adjustment or orthodontics may be recommended to help solve the problem.